One of the fun things about blogging is the surprises it can bring your way. 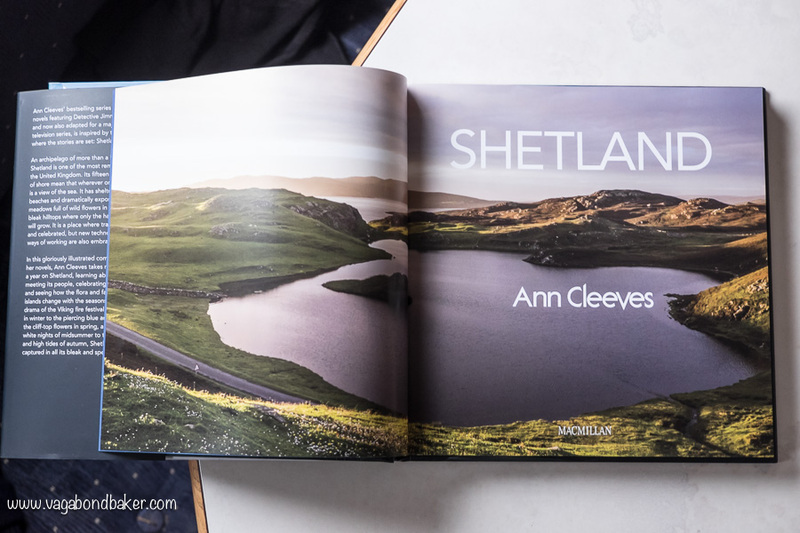 When I was happily snapping my way around Shetland in the summer I had absolutely no idea that come Autumn I would be seeing some of those photographs on the pages of a beautiful book by renowned author Ann Cleeves! 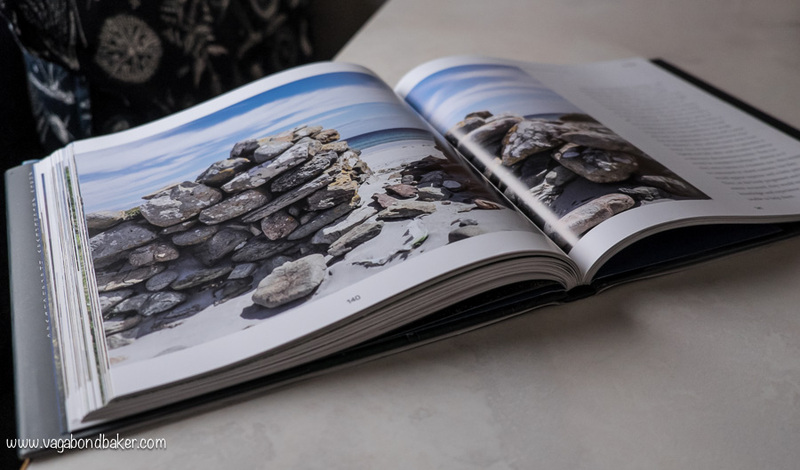 Walking into a bookstore and seeing the book piled up on the new release table sent my heart skipping, knowing that I would find some of my images within: it was so exciting! 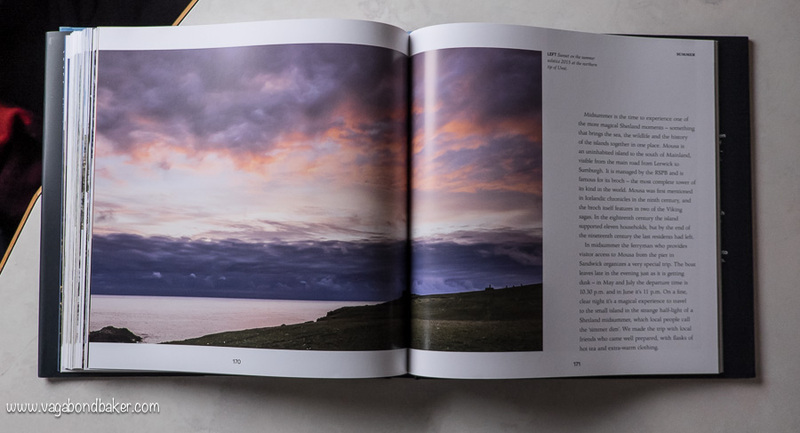 The book –’Shetland’ – follows a Shetland year, season by season and it’s jam-packed with photographs to beautifully illustrate these spectacular islands: twenty-three of which I took! Come, have a look through it with me! So, imagine my excitement when I turned to the inside cover page to discover my photo had been used for it! I would like to thank Elizabeth of Elizabeth’s Kitchen Diary who told us about this stunning location after we met up with her earlier in the day, we would never have found otherwise. As I took a walk up from our parked up spot (Thundertruck is just out of the frame of this pic) in the sublime evening light I turned and took this picture, I can remember taking it, it was such a special evening. While I have worked as a pro photographer doing stuff like charity calendars (hello naked Hotties Helping Heroes!) 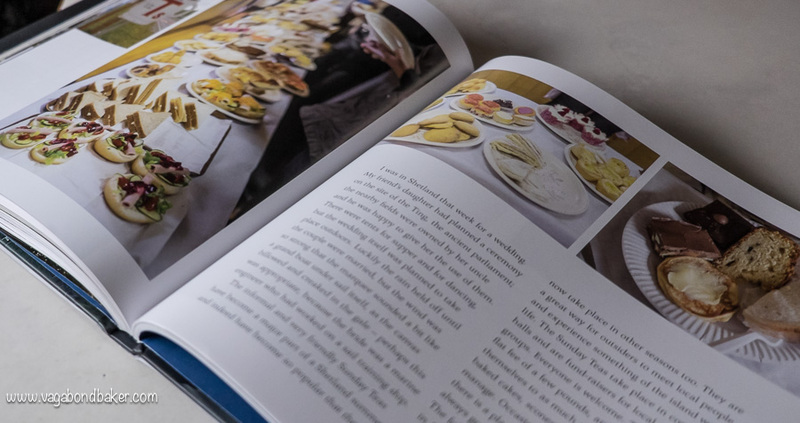 and a few weddings/events, this is the first time I’ve had my work published in a book, and I can tell you it is super exciting – have I said that before? 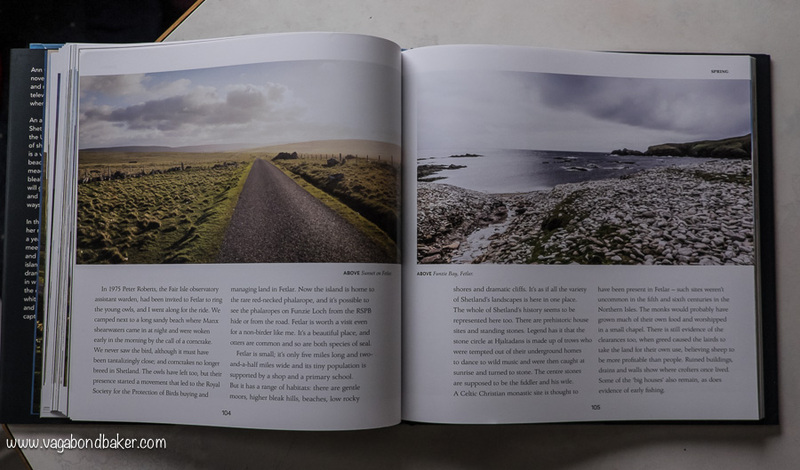 There’s something rather wonderful about having your travel memories in a proper published book too! Well, it came from blogging! 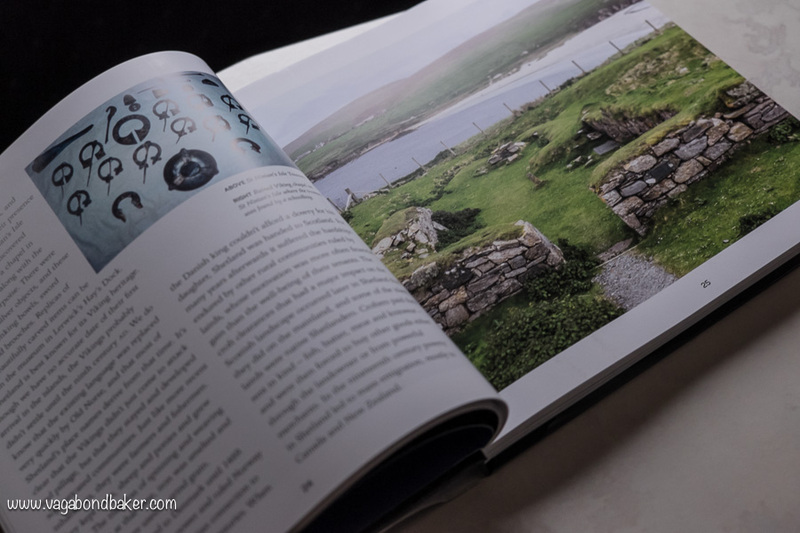 After posting my first week’s diary post from Shetland, I was contacted – through my blog comments below the post – with a request to have a couple of my images from the post licensed for use in a book. Yes, it was my obsession with experiencing Shetland’s famous Sunday Teas that got me the gig! I’m not sure exactly what brought Dan (of Perfect Bound) to my blog but we entered into an email dialogue and eventually twenty-three images – including a few of the Sunday Teas – were chosen and a price was agreed. This required me to go back over them: the quick edit for my blog needed a more thorough approach for sending as high-res images to be printed! 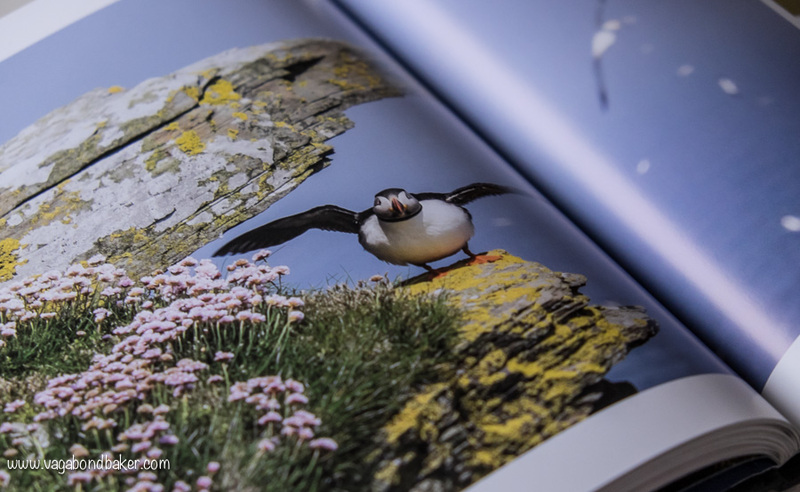 I’m obviously very proud of all of the photos, but I’m particularly pleased that a couple of my wildlife shots have been included, especially my favourite puffin picture! As I spend a lot of time with wildlife photographers I often feel a little left out as it’s not really my forte: with my little Fuji mirrorless camera and short lenses I feel very inadequate at it alongside my fella and friends who have mahoosive wildlife lenses! Shetland nature is so abundant and at such close range even I could have a go at being a wildlife photographer, and get those photos published in a book! This was also reassuring: I switched from a full frame professional DSLR Camera (Canon 5d II) to my now much loved Fuji X-T1 mirrorless camera – because I’d become to hate the weight of the big camera – at the beginning of the year and I’m over the moon with the quality of the photos, proof of how versatile this little camera is! 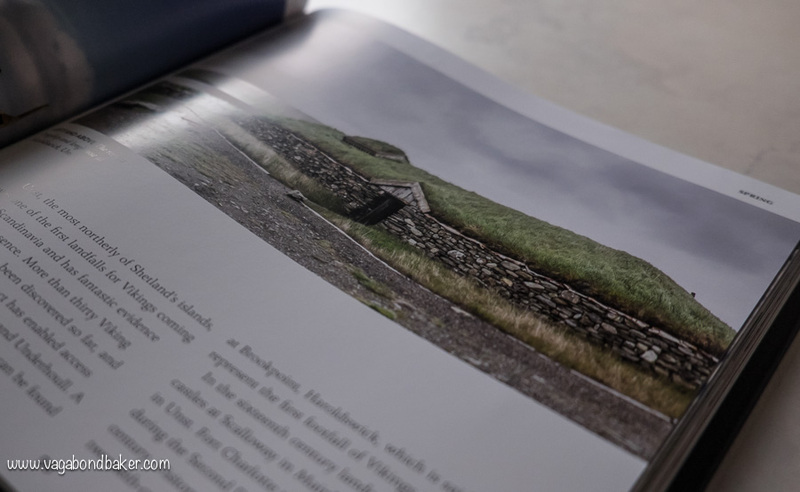 The main reason we had gone to Shetland in the first place was because I wanted to experience midsummer at the most northern point I could reach. 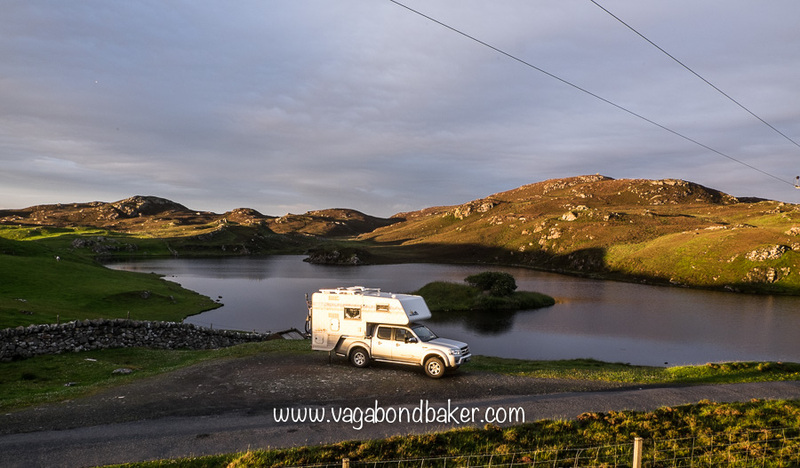 Our loosely planned road trip to Scandinavia was postponed for a year and Shetland became the most northern destination within reach. Waking up at sunrise on Midsummer morning, peeking out of the truck camper window to see the dramatic clouds rolling in off the North Sea from our wild pitch near the top of the island of Unst was a magical highlight of the trip: I wrapped up, grabbed my camera and took a few photos of the sunrise from just outside the van. I’m so happy to have this moment recorded in this book, it was certainly worth getting up at 3.30 am! I didn’t take the photo of the horse! I had the pleasure of meeting the Ann, the author, this week as she was doing a book signing in Waterstone’s Dundee. 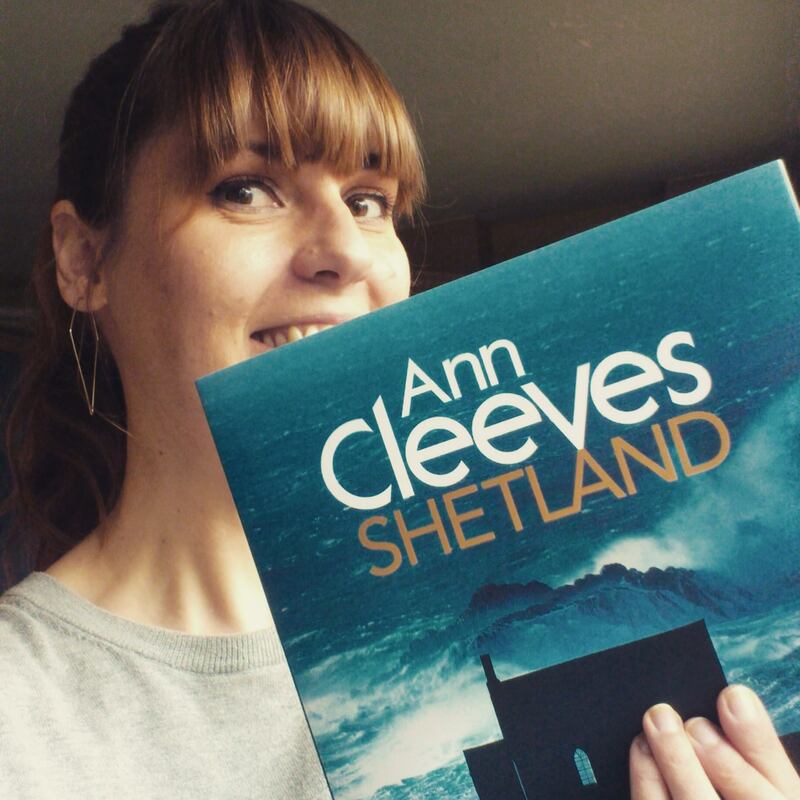 Ann signed my copy, I’d love to say we had a lovely in-depth conversation about Shetland but I get a trifle tongue-tied in situations like this – I wish my conversational skills matched my writing skills! It’s a good job I can let my pictures do all the talking! 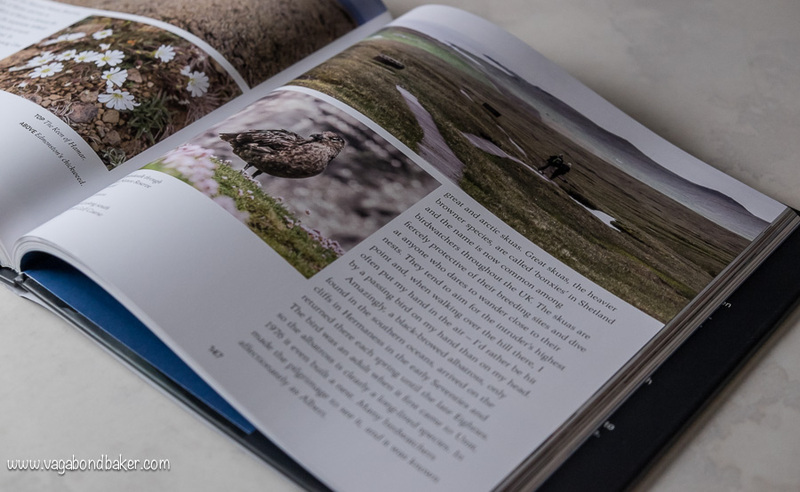 I’m so thrilled that my little blog led to having my photographs included in this book, it really is the icing on the cake from that incredible four-week summer trip to Shetland. 12 Ways Shetland Will Amaze You Glorious photos and animated puffin gifs aplenty! Midsummer in Shetland, Diary for week 2 Wild on Unst! Hufsie Cake A Shetland specialty, a delicious fruit loaf cake. 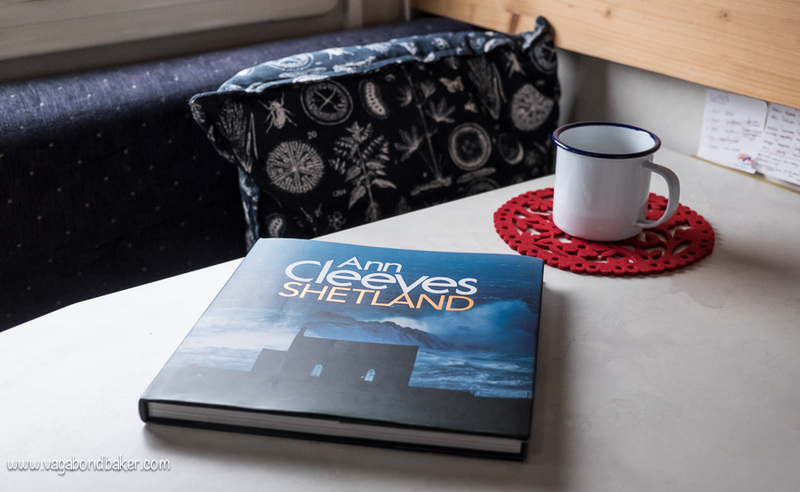 or check out this guest post I contributed on Heart My Backpack blog about why you should visit Shetland! 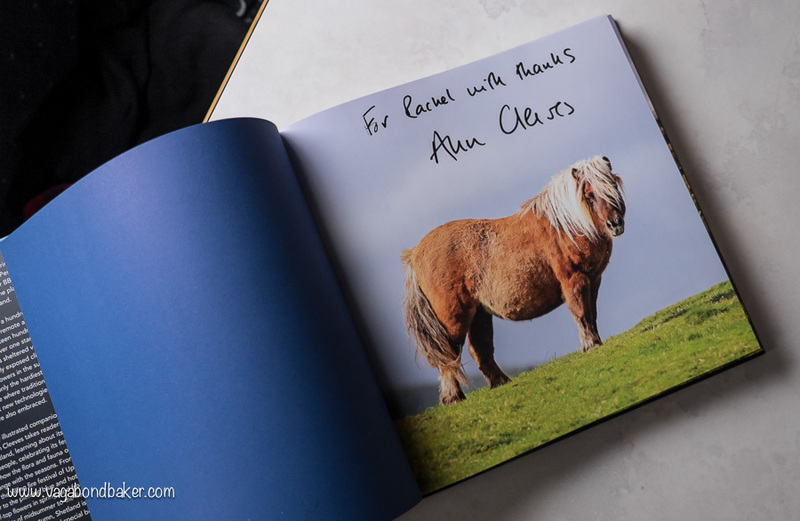 *NB* If you buy the book, or products, via the affiliate links I will get a teeny bit of a commission which helps to keep this blog and my nomadic life going! Thank you! Have you seen this book in stores? Have you had anything surprising come from blogging? Thank you! 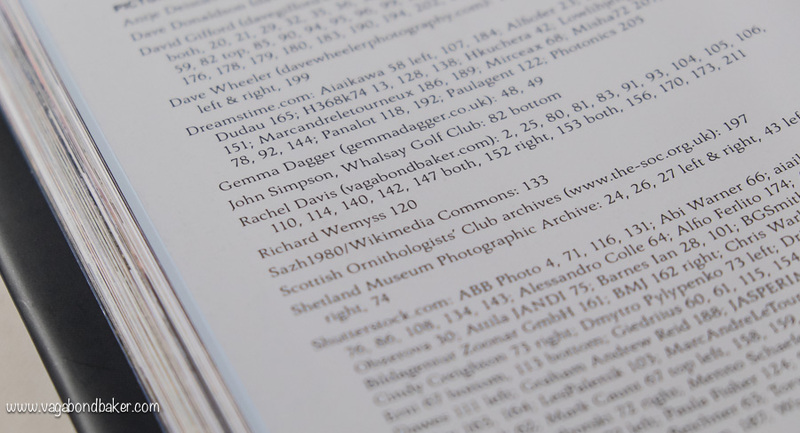 It’s so exciting to open an actual book and see your work in there! Just magic! I’m so impressed and excited for you also of course!! 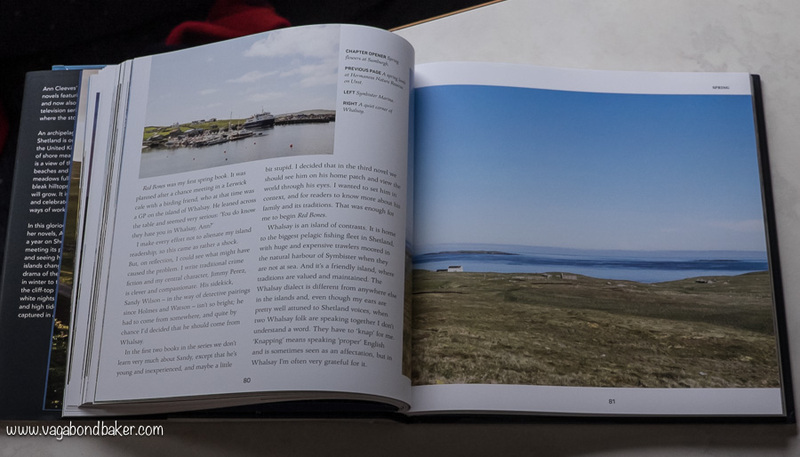 Well deserved Rachel, this is such a great story to read, I can’t begin to imagine how excited you must be to have your work included in what looks like a wonderful book on Shetland. It’s so thrilling to be included, I turn a page and see my photo, remember the time and experience when I took it. So special! It is really beautiful and congrats! Thank you so much, I’m so thrilled with it! Wow! Wow! Wow! How awesome is that. I only found your blog last week and now I know I’m with some really great talent and the photographs are marvellous! Congratulations Rachel. This is fantastic and i’m so happy for you. I think, it’s the dream of any blogger or writer to get and see their words into print media. And as for a book. Well, it’s immortality! And yes, my blog brought me a feature in a documentary about British expats in Berlin, a couple of newspaper interviews including The Telegraph (still to be published lol) and a wonderful position on a prime-time evening show as a TV moderator and “local expert on the monarchy” when the Queen came to Germany this summer!! They all found me ‘cos of my blog! Wow, a tv moderator, that’s super exciting: amazing that blogging got you that gig! Local expert on the monarchy, impressive! That must have been fun! I shall look out for that Telegraph piece! The pictures are just gorgeous – very well deserved. There’s always something special about seeing things in print. p.s. After having a look at your mirrorless camera at Traverse I’ve been converted and am saving for an upgrade! Amazing news – congratulations 🙂 The photos look beautiful, very well deserved! Kiitti Saana! Blogging certainly can give you candies and treats every now and again, so wonderful. Have you been given any? Oh thats a shame, you should definitely be paid for your photos, if they won’t pay then that’s certainly a bad company policy. Don’t knock your photos either, they look great to me! That’s a shame the course was a waste of time, and money. The weather has been awful here too most of November: dark, wild and wet. Not good for photography. Congratulations, Rachel. Your photos are amazing and their inclusion is well-deserved! Thank you so much Meghan, I’m so proud of them!